According to the report, the global HbA1c testing device market accounted for around USD 1.20 billion in 2015 and is expected to reach approximately USD 2.20 billion by 2021, growing at a CAGR of around 11 % between 2016 and 2021. Hemoglobin is the red protein molecule responsible for carrying oxygen from lung to the body’s organ and tissues. Glucose molecule sticks to the N-terminal amino acid of the hemoglobin molecule by nonenzymatic attachment to form a hemoglobin A1c or HbA1c, also called as glycosylated hemoglobin molecule. Diabetes mellitus is a common form of diabetes, caused by pancreatic insulin deficiency, which affects metabolization of starch and sugar. HbA1c level reflects the average glucose concentration over the previous period and provides a much better indication of body glucose control than urinary and blood glucose determinations. The growth of HbA1c testing device market is propelled by increasing number of diabetes population. Geriatric and obese populations are more prone to diabetes mellitus. Globally, USD 673 billion healthcare expenditure is spent on diabetes management which is 12% of total healthcare expenditure. In 2015, around 5.0 million deaths are due to diabetes. 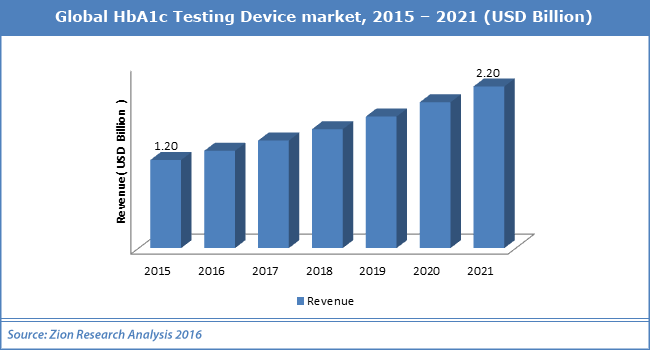 Moreover, emerging technologies for diabetes management and increasing awareness of diabetes preventive care are projected to fuel the growth of HbA1c testing device market. In addition, increasing doctor’s prescription pattern for HbA1c testing is a key factor for generating more demand for the HbA1c testing device. On another hand, the high cost of device and limitation of results of the certain population like pregnant, elderly and non-Hispanic black could be a roadblock in the market. Nonetheless, untapped market and increasing demand for medical tourism in emerging markets are likely to open new opportunities in the forecast period. Based on the device type, the market of the HbA1c testing device has been classified into the handheld device and bench-top device. Bench-top HbA1c testing device is widely used in the diagnostic laboratory due to minimal handling and fastest & accurate results. Bench-top HbA1c testing device segment has acquired the largest market share of more than 65% in 2015 compared to the handheld device and in forecast period handheld HbA1c testing device is projected to grow at the healthy rate. Based on the technology the market of the HbA1c testing device has been segmented as ion-exchange HPLC, enzymatic assay, affinity binding chromatography, turbidimetric inhibition immunoassay and other. With more than 30% revenue contribution, affinity binding chromatography segment was leading the HbA1c testing device market in 2015 due to increasing investment by the manufacturer in the medical device. HbA1c testing device market is segmented on the basis of end user into hospitals, home care, diagnostic laboratory and research institution. Diagnostic laboratory segment dominated the market followed by home care segment and it is expected to grow at the highest rate in the forecast period. With increasing home care service and demand for homecare HbA1c testing device, homecare segment will exhibit significant growth in the forecast period. Based on region, HbA1c testing device market is segmented into North America, Europe, Asia-Pacific, Latin America and the Middle East & Africa. With more than 44 million diabetic populations North America dominated the market has the strong presence in the HbA1c testing device market. With increasing cases of diabetic cases and increasing medical tourism Asia-Pacific is expected to experience high growth in the forecast period. Key operating players in HbA1c testing device market are like Transasia Biomedicals ltd., Abbott Laboratories, Alere, Inc., Arkray, Inc., Bio-Rad Laboratories, Inc., Danaher Corporation, F. Hoffmann-La Roche Ltd., Siemens Healthcare and Trinity Biotech plc.